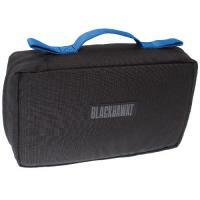 This pouch from Blackhawk is the same design as in the S.T.O.M.P. II Medical Coverage Pack. It can be used to replace the one supplied with the S.T.O.M.P., carried in a different pack, or used as a stand-alone medical supply pouch. It is made from tough 1000 denier ballistic nylon, with reinforced stitching for increased durability and wear resistance. Its web carry handle makes it easy to tote around, and closed loops on each side allow you to anchor it easily. The pack interior features multiple slip pockets, pouches and elastic loops, allowing you to store and organize your medical supplies for rapid access.